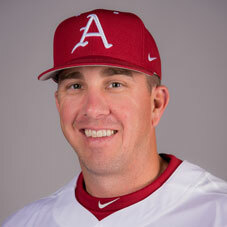 Clay Goodwin is entering his ninth season with the Arkansas coaching staff as its Director of Baseball Operations. In his capacity as the Director of Baseball Operations, Goodwin coordinates many of the behind-the-scenes aspects of the Razorback baseball program as he works in conjunction with the Arkansas coaching staff. Prior to his appointment to Director of Operations, Goodwin spent the 2006 season as the Razorbacks’ fifth-year student assistant coach. He assisted the UA coaching staff with practices, day-to-day administrative duties and game day activities. He helped hitting coach Todd Butler with hitting instruction, while assisting with the Razorbacks’ infield. He then served as a team manager for Arkansas during the 2007 season. Goodwin was an outstanding player for the Razorbacks over four seasons and his name is littered throughout the Arkansas record book. An excellent defensive third baseman, he was also known to have an effective bat as he finished his career with a .297 average, 49 doubles, 12 home runs and 127 RBI. At the conclusion of his four years, he ranked eighth in career at bats (750), tied for ninth in career hits (223) and tied for fifth in career singles (157). Goodwin appeared in 202 games as a Razorback, making 193 starts. He hit a team-best .332 as a sophomore and followed that with a team-leading .319 average as a junior. His run production spiked as a senior with a career-best five home runs, 17 doubles and 42 RBI. He also finished his career with a .934 fielding percentage at third base and 408 assists. Goodwin was born on Oct. 1, 1981, and graduated from the University of Arkansas in May of 2005 with a degree in kinesiology. He completed his master’s degree in the fall of 2006 at the University of Arkansas in workforce development. Goodwin is married to the former Jill Johnson. They have one daughter, Caroline (5), and one son, Gage (1).